In fact, the referendum didn’t actually do anything, except signal to the British government that its voters wanted to leave. While all leading politicians promised to respect the results, the official process couldn’t start until the UK delivered formal notice to the EU. Theresa May, the UK prime minister who replaced David Cameron last July, wanted to make sure the British government had its priorities and negotiating positions in order before delivering the notice. After many months, she finally did that on March 29, 2017. Now it’s time for the UK and the rest of the EU to negotiate the details of the divorce. But the UK already wasn’t part of the EU’s free-travel Schengen Area, or part of the shared-currency Eurozone. So what will actually change when the country quits? "Hard Brexit" vs. "Soft Brexit"
Most details of the UK’s break from the EU are still unknown, but the many possibilities can be divided into two general categories: A “Soft Brexit” would allow the UK to keep some of its special economic ties to the EU, and maybe even the Single Market arrangement that lets goods, money, services, and labor move freely between member countries (the so-called “four freedoms”). “Hard Brexit”, on the other hand, would mean a clean break from the Single Market, requiring the UK and the EU to negotiate their economic relationship from scratch. The EU insists on including the “four freedoms” as a package deal, so if the UK doesn’t want one of them, it’ll have to give up access to all of them. EU leaders fear that letting the UK pick and choose the best parts of membership might encourage other countries to do the same. 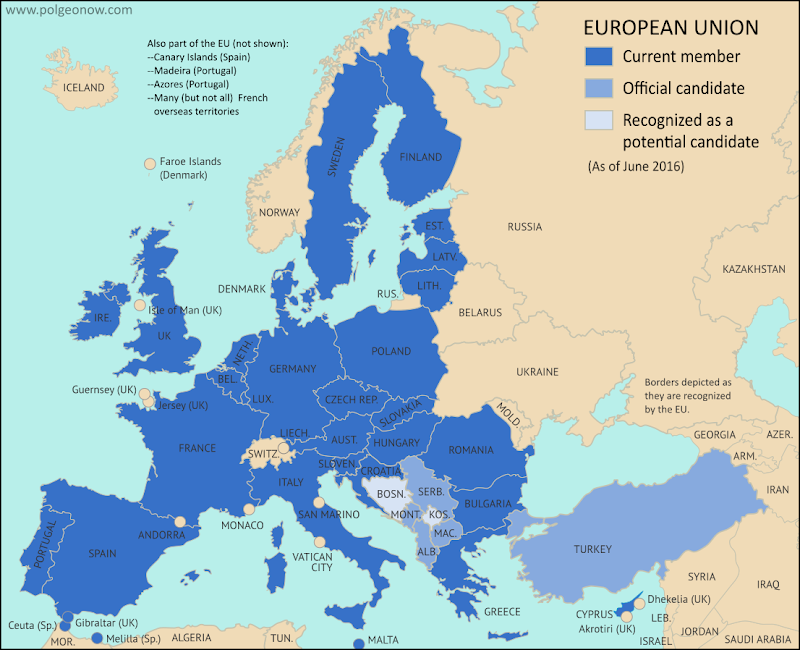 Some non-EU member countries, like Norway and Switzerland, do have partial membership in the Single Market; they generally still have to accept the “four freedoms”, but are allowed exceptions from certain market-wide regulations. They also were never in the EU to begin with, so they were able to negotiate from a stronger position. Why It Matters: Immigration was one of the driving issues behind the Leave campaign’s success in the Brexit vote last year. Then-Prime Minister David Cameron had promised to drastically reduce migration; but as long as EU law required free movement of labor for EU citizens in and out of Britain, his hands were pretty much tied. Brexit supporters ran on a platform of regaining control over the country’s borders, promising to limit immigration to much smaller rates than British people are used to now. Since the immigration issue was one of the most visible of the campaign, it’ll be a big deal in the news during negotiations. What Might Happen: Current Prime Minister Theresa May has consistently said Brexit must mean full control of the UK’s borders and the flow of people coming into the country. While politicians aren’t known for keeping their promises, this is one she’s been clear on for so long that it would be hard for her to break it. In an April interview, however, May expressed openness to an “implementation period” in which businesses and governments would have time to adjust to new policies. This could include an extension of the free movement of people – though May still insisted that border and immigration policy would be under British control during that period. Why It Matters: One of the more difficult circles to square will be the fate of the border between Ireland (an independent country) and Northern Ireland (a part of the UK). Even though the UK isn’t part of the EU’s Schengen free travel area, it has a special agreement to keep the Irish border open to travelers, and the “four freedoms” of the EU Single Market let residents easily do business on either side. From the 1960s to the 1990s, some 3,500 people in Northern Ireland were killed in a violent conflict over whether the region should join independent Ireland or stay in the UK. The Good Friday Agreement of 1998 led to a cease-fire that’s mostly held since, probably in part because the border is “irrelevant”. But that could all change after Brexit, when the boundary might come to divide the EU Single Market from a border-controlled UK. Meanwhile, tens of thousands of jobs are threatened if cross-border economic activities get cut off. 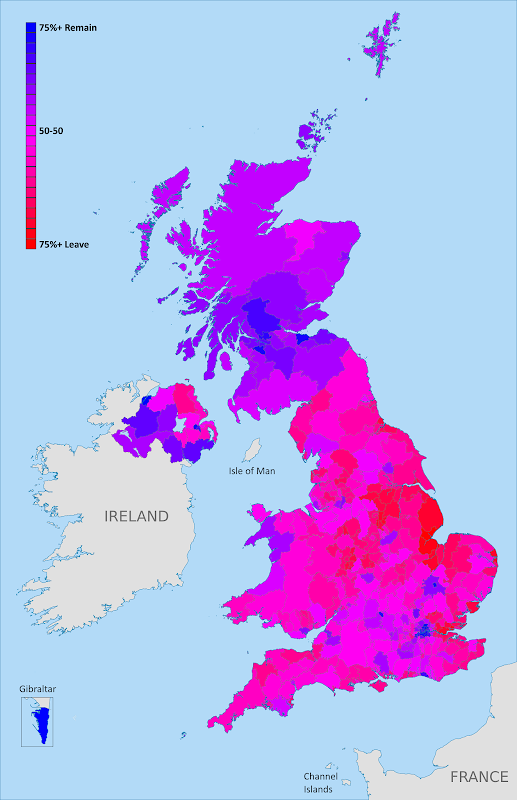 In last year’s Brexit referendum – where Irish citizens residing in the UK were allowed to vote alongside their British neighbors – Northern Ireland voted against leaving the EU, but with sharp differences from district to district. Brexit negotiations will also decide the future of Gibraltar, a tiny UK-controlled peninsula attached to southern Spain. The territory, though not officially part of the UK, has been under British control since 1713, and some in Spain hope to use the negotiations as leverage to advance their own country’s claims to it. The EU has promised Spain veto powers over any future trade deal involving Gibraltar, which would allow the Spanish government to “demand concessions or make the border with Gibraltar harder to cross, effectively isolating the territory.” Whether Spain will use its power that way is still unknown. What Might Happen: Former UK prime minister Tony Blair thinks a hard border with checkpoints and passport controls “really would be a disaster.” Fortunately, both sides have said they want to leave the border as open as possible: May has promised work for a practical solution allowing free travel between Ireland and Northern Ireland while still “protecting the integrity of the UK’s immigration system”, and the EU negotiating guidelines call for a “flexible and creative” approach. Some have suggested this could mean an open border in Ireland, with a “hard border” separating Northern Ireland from the rest of the UK. However it turns out, you can bet PolGeoNow will be covering these developments! Why It Matters: Thanks to the free movement of people guaranteed by the EU, about 1.2 million British nationals live in other EU states, and 3.2 million non-British EU citizens live in the UK. Many have lived there for decades. Until now, they’ve enjoyed access to most of the same rights and privileges as their local neighbors, but Britain’s exit from the EU opens that up to debate. What Might Happen: Both sides generally favor allowing existing residents to stay and retain access to services, though the details will take time to hammer out. The EU wants these rights guaranteed by the European Court of Justice (ECJ), but the UK government has been clear that the ECJ will not have any jurisdiction in Britain after Brexit. Another issue is what day citizens must arrive by to be eligible under the agreement: The day of the referendum? The day Article 50 was triggered? The day an agreement is ratified? We should find out soon, since both the EU and the UK have agreed citizens’ rights is one of the first topics on the agenda. Why It Matters: Confusingly, “passporting” has nothing to do with what we usually think of as a passport: the identity document that gets stamped when you enter a new country. In this case, it’s actually an authorization that allows banks and other financial institutions in one EU country to do business in the any of the others. This is a specific part of the Single Market, but it’s especially important because London’s status as Europe’s unofficial “financial capital” means there’s a huge volume of cross-border financial business between the UK and the rest of the EU. One estimate indicates that if the UK lost all EU passporting rights, it could cost almost $25 billion in annual revenue. Another says London banks may have to move close to $2 trillion, or 17 percent of the UK banking system, to EU-based locations. Yet another claims that up to 80,000 jobs in the finance sector could leave London in the next two years as banks prepare for the worst. What Might Happen: Only EU-based firms are eligible for passports, so unless an exception is negotiated as part of Brexit, British banks will lose that right. It won’t stop them from conducting business elsewhere, but it does mean they have to apply for a license in each individual country. Ominously for the UK, new French president Emmanuel Macron is on the record saying British financial institutions shouldn’t get a special deal. Britain’s finance industry is already expecting to lose full passporting rights, but hopes a more limited deal could allow some important services to continue. Why It Matters: This really is the issue of the whole negotiation process; it’s woven into all the other topics discussed above. How close and what type of an economic relationship will the UK and the EU have after Brexit is finalized? What Might Happen: Though anything is still technically possible at this point (staying in the Single Market, getting out, keeping other agreements, or temporarily staying in while a new relationship is finalized), May’s government has been fairly clear about its plans to pull the UK out of the Single Market and renegotiate its relationship with the EU from scratch. But since her Conservative Party lost its parliamentary majority in June’s snap elections, there’s been a push to at least keep Britain in the EU’s customs union. A customs union is a less-ambitious version of the Single Market, where member countries have a shared policy on imports from non-members, and no taxes on importing or exporting between members. It doesn’t include free movement of people, or the unified rules of business that make free movement of labor and services practical in the EU. Only time will tell how the recent electoral losses will affect May’s negotiating positions, but the decision on whether to allow free movement of people will be the linchpin. If the UK is willing to accept this, it can get the greater economic access that Northern Ireland and London’s financial sector want. But if full control over British borders is non-negotiable, the UK will get only partial access at best. Following this story? View all Brexit articles on PolGeoNow!